Trials and endurance. An opportunity for joy? What a difficult concept to grasp. Running is the one thing in my life that I can say has given me a more pure understanding of the ability to rejoice through trials. Few things in life feel more joyful than finishing a particularly difficult workout and knowing you overcame the desire to quit in the middle of it and pushed through to the end. It’s hot and steamy in South Mississippi. I’m fat and slow. Sometimes, it seems like I’m so slow that I’m actually running backwards. I know that’s not possible, but the same landmarks keep appearing in my line of vision as though I’m running past them over & over. Kind of like how I keep praying for the same things over and over and when God answers, I can’t even see the answer right in front of my face because it wasn’t the one I was expecting. I was cleaning out a cabinet this week and found some prayer journals from the early 90’s. I was praying then for some of the same things I pray for now, and it got me to thinking. Had God really not answered those prayers? Or had He answered them in such a way that I didn’t feel was appropriate? Paul struggled with a “thorn” that God never removed despite many fervent, and I’m sure, agonized requests. I’ve struggled with weight issues for my entire life. Even when I shouldn’t have been concerned about weight, I allowed society and satan to affect my thinking to the point that I’ve always considered myself overweight. That is wrong on so many levels, and I think I’m finally coming to a clearer understanding of that. My goals over the last few years have been centered on fitness and becoming stronger, and I’ve certainly achieved that. I have a long way to go to be as fit as I want to be, but I’m well over halfway there. But, apparently, my weight issues will continue to be a thorn for me. I’m very aware that, as thorns go, this is a really small one. Perhaps this is God’s way of ensuring that I stay focused on maintaining fitness and health. Instead of throwing my hands up in frustration and quitting, He wants me to keep walking the walk (or running the run), and not give up or give in. 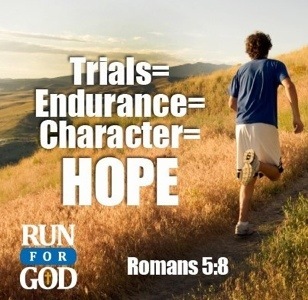 Trials and endurance. An opportunity for joy. It doesn’t feel joyful when I step on that infernal scale. But, I’m searching for the joy. And I’ll keep up the fight. If our walks (or runs) through life were easy, how would we ever be able to empathize with someone whose walk is a struggle? My battles may not be your battles, but we all have them to fight. Learning to continue to fight, even when there seems to be no relief in sight is probably one of the hardest things to do. I’m struggling to make this fight an opportunity for joy in my life. 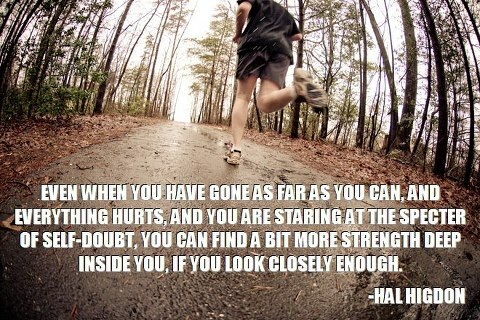 Running has taught me that you can accomplish anything you want, but the journey to your goal will not be easy. Sometimes, it will be downright ugly. I’m at that ugly point right now, but as He always does, I know that God will make beauty from ashes. I’ll keep fighting the fight secure in that knowledge. Do you ever feel completely overwhelmed by the world? By the tasks that have been assigned to you? By the nature of the world that we live in and the “me” generation it has produced? It’s been that kind of week for me. I wrote last time about listening when God speaks. It’s a difficult task to master, and I’m usually much too chatty to sit still and listen. But, lately, I’ve been so overwhelmed with the spirit of the world that I’ve been reaching to God’s word more and more for comfort, peace, and understanding. It’s made me more attentive to His voice. The trouble with that is that I have a more clear vision of the things He expects of me. I say the trouble because I feel like I’m not up to the task. I’m woefully inadequate. I have become a little reclusive as I’ve gotten older. Not to the point of being a hermit, just treasuring my alone time a little too much. Knowing all the while that God expects us to be part of the world. We have work to do. But, the truth is, I’m not that crazy about people. There, I said it. God has tasked me with something recently that is a little frightening and completely overwhelming. I feel useless and unable to put coherent thoughts together that will enable me to accomplish this. I keep reminding myself of the “regular” folks He has used throughout history to accomplish His will, but right now, they just make me feel more inadequate. For many years, I’ve told other women that God won’t give you a task that you can’t perform. You won’t necessarily have the skills to accomplish it, but He will give you His grace, His wisdom, His talent, His ability and enable you to complete your piece of the puzzle. It’s time I put feet to that belief and move forward in the knowledge that He will give me His wisdom and grace in my moments of need. He gives us these seemingly undoable tasks so that we will fall into His arms and seek His face. Just as He allows us to hit rock bottom before we can climb our way out of the abyss. He wants us to realize that in ALL we do, we are completely dependent on Him. The verse I quoted at the start of this post was in my Bible reading this evening. After I read it, I couldn’t read any further. My eyes kept going back to that verse and reading it over and over. It’s the verse He meant me to see this week. I am God’s masterpiece and He has plans for me. He has them for you, too. Don’t allow Satan to rob you of the knowledge that God will walk your path with you, no matter how dark or dangerous, no matter how hopeless it seems. I’ll close with this prayer of Paul’s to the Ephesians. It’s my prayer for you (and me! ), too. Let our hearts be flooded with Light!! This picture was in my home feed on Facebook last week. There are several inspirational pages that deal with running and fitness from which I enjoy getting daily posts. When I saw this photo, it stopped me in my usual quick scroll through to check messages. Tears filled my eyes, not tears of pity, but the kind of tears that fill your eyes and clog your throat when America wins gold at the Olympics. This woman is a hero. Her name is Jackie and I don’t know her at all (although I would LOVE to if anyone can hook us up). 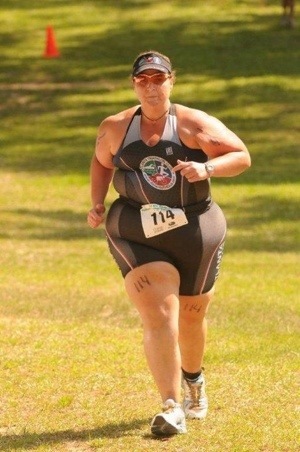 This image had been on another page that is devoted to tri-athlete women, and the running page had picked it up. In her comments that were included with the image she said how at one point she had weighed 415 pounds and walking to the mailbox was a struggle. She said that it’s not easy, but she gets off her a$$ and just does it. She does this for her, she tunes out the negativity and just goes for it. She is participating in a half Iron man in Augusta (GA?) on September 30. I can’t even express how much this humbles and inspires me. I’m not a tri-athlete, but the sport does intrigue me. Unfortunately, I have a difficult time attaining mediocrity (let alone excellence) when I divide my focus, so while I do cycle and swim, right now it’s to keep me uninjured and able to run while maintaining my aerobic ability. Jackie is proof positive that we have no excuses. She’s getting it done. There was another reason this image moved me to tears when I saw it. This year has been a little frustrating for me as I’ve struggled to lose weight. I am a fairly disciplined person, yet the pounds are coming off at a slower than glacial rate. I’ve finally found an eating plan that I can stick with for life, but even after two months, I’m only down five pounds. I’m ecstatic that the scale is finally moving, just wish it would move faster. I usually only weigh once a month (I have really weird issues with the scale) and this week dawned a new month. I have to admit, I felt tears of frustration ball up in my throat when I got on the scale Wednesday morning and it was down less than a pound after a MONTH of very disciplined eating and exercising. My prayers that morning were filled with lots of “Really, God? Why is this so difficult for me?” As usual, He listened patiently. When I finally stopped feeling sorry for myself and got still enough, He spoke. This doesn’t happen often for me. I’m sure it’s because I’m seldom quiet or still enough to listen. I usually have my laundry list to recite to Him, then I’m on about my day. But that day was different. He gently reminded me that not only am I not the only woman (or man) who struggles with this, I really don’t have as much of a struggle as some. And, He offered me a beautiful reason for it. He reminded me that I struggle because the women that I love struggle. It keeps me humble and serves as a reminder that we ALL have issues that are difficult for us. And, if we are to be able to reach out to help others, we sometimes have to walk a difficult path that we really don’t want to be on. Then He reminded me of all those who have had faith before me. Those who questioned, but remained faithful. Abraham and Sarah, to whom so much was promised, struggled with doubt to the point that they tried to take things into their own hands and made quite a mess of it. Still, God was faithful to the promises that He made to them. If God is allowing you to hit rock bottom, it’s because He has a plan for you when you’re out of the pit. He’s allowed me to hit bottom so many times that my bottom is sore & bruised from landing on it. I’m sure it’s because I’m such a slow learner. Be inspired by Jackie. She said in her comments on the photo that if she could inspire one person to get up and do it, then it’s worth it to her. Don’t think you have to run a marathon or participate in a triathlon in order to get healthy. You don’t. You never have to run a race at all. Start slow, and remember that slow progress is still progress.